In these metro areas, small real estate investors can expect to find great home deals and double-digit returns on their investment, according to RealtyTrac. 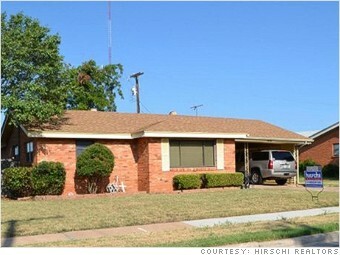 For sale: This Wichita Falls home is listed for $89,900. Mom-and-pop investors who buy properties in this North Texas prairie region and rent them out are seeing double-digit returns on their investments, according to a report from RealtyTrac. Much of the economy relies on oil production and farming. Homes are cheap and rents -- at a median of $940 a month -- are pretty lucrative. The nearby Sheppard Air Force Base helps. It not only accounts for 20% to 25% of the area's economic activity, but supplies a steady stream of renters. "Many of the service members know that they're only going to stay three or four years and they choose to rent," said Danny Steed, a local real estate broker. A good example of the homes in the area is this nearly 1,700 square-foot brick home in Wichita Falls, which was recently listed for just $89,900. *Return on investment is also known as gross rental yield, which is the percentage of profit or loss from an investment that is calculated by dividing the annual gross rental income by the purchase price or market value of the property. Ratings were calculated by comparing gross median rents (the return on investment before accounting for taxes, maintenance fees and other costs) for three-bedroom homes to median home price. All of the markets were relatively strong economically, with unemployment rates below the national average.